Hydrated skin has always been in, but it feels as though it’s having its biggest moment ever this year. The real litmus test for me is my mum; she’s a limited user of skincare (but has the best skin, natch), so if a trend has filtered through to her then I know it’s become a ‘thing’. Case in point, she recently heard about the wonders of everyone’s favourite skincare ingredient, hyaluronic acid, and is mining me for information. So instead of a lengthy WhatsApp message back I’ve done the sensible thing and turned my recommendation into a blog post. Daughtering, 2018 style! 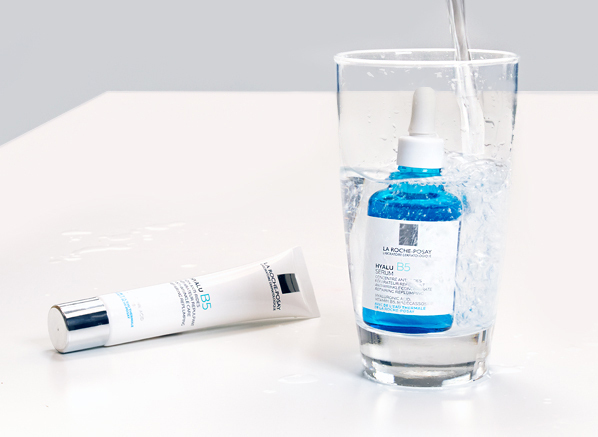 So, what on earth is hyaluronic acid, and what can it do for you? Produced naturally within the body but synthetically produced for skincare, hyaluronic acid is a really efficient humectant – or ‘moisture magnet’ – that temporarily attracts water to the skin’s surface and uppermost layers. When applied topically it’ll plump and smooth your complexion, which, by proxy, will make it look fresher and more youthful. I like to think of it as the little black dress of your skincare collection; it goes with everything and is great for everyone. In a nutshell, the Hyalu B5 collection is for anyone whose complexion is dull, slackened, dehydrated and generally just a bit tired, regardless of their skin type. Both products in the range contain two different-sized hyaluronic acid molecules concentrated at 0.3%; a larger one to hydrate and smooth the surface of the skin, and a smaller molecule to penetrate deeper into the skin and plump up from within. Aside from the hydrating goodness of hyaluronic acid, Hyalu B5’s other main ingredient is 5% vitamin B5, another moisture-attracting humectant that has the added benefit of aiding the repair process of skin. Added madecassoside stimulates collagen synthesis and reduces inflammation for supreme softness, and its added antioxidant benefits help to prevent moisture loss by fighting free radicals. The star product of the collection is the La Roche-Posay Hyalu B5 Serum Anti-Wrinkle Concentrate, without a doubt one of my most-recommended products of 2018. Everyone loves this super-quencher. With a texture that can be described as something between gel and water, the Hyalu B5 Serum applies with a cushiony glide, then disappears without a trace to leave skin feeling supremely comfortable without any weight. Its feather light feel makes it a great universally-pleasing product; it doesn’t matter whether your major concern is oiliness, sensitivity or accelerated ageing, this serum will effortlessly slot into your existing routine between cleansing and moisturising for an instant boost of hydration. The matching Hyalu B5 Cream also has a beautiful, barely-there feel. Created for all skin types, it’s a fantastic quencher that promotes freshness and balance without a hint of residue. Those with very oily or very dry skin might want to pair the Hyalu B5 Serum with their usual moisturiser, though, as it’ll offer added benefits that are more specific to managing your skin type. A great choice for those concerned with ageing is Redermic [R], a retinol night cream that forms a powerful, reparative regime when paired with this serum! So, what will your new hyaluronic acid regime look like? Probably not as dissimilar from your old one as you might think! After cleansing, pat your skin dry and apply a few drops of the Hyalu B5 serum. I work a little between my palms and press onto skin (avoiding the eye area), but you can also lightly massage if that’s your preferred application method. Next, reach for the Hyalu B5 Cream or your moisturiser of choice and massage that in, et voila. Consider yourself quenched! This entry was posted on Friday, July 20th, 2018 at 2:42 pm and is filed under French Pharmacy, Skincare, Tried & Tested. You can follow any responses to this entry through the RSS 2.0 feed. You can skip to the end and leave a response. Pinging is currently not allowed.